At this point, we'll begin a full study of dynamics, starting with the laws of motion. The text, Landau, begins (page 2!) by stating that the laws come from the principle of least action, Hamilton's principle. This is certainly one possible approach, but confronted with it for the first time, one might well wonder where it came from. I prefer a gentler introduction, more or less following the historical order: Galileo, then Newton, then Lagrange and his colleagues, then Hamilton. The two approaches are of course equivalent. Naturally, you've seen most of this earlier stuff before, so here is a very brief summary. 1. The realization, and experimental verification, that falling bodies have constant acceleration (provided air resistance can be ignored) and all falling bodies accelerate at the same rate. 2. Galilean relativity. As he put it himself, if you are in a closed room below decks in a ship moving with steady velocity, no experiment on dropping or throwing something will look any different because of the ship's motion: you can't detect the motion. As we would put it now, the laws of physics are the same in all inertial frames. Newton's major contributions were his laws of motion, and his law of universal gravitational attraction. In terms of Newton's laws, Galilean relativity is clear: if the ship is moving at steady velocity relative to the shore, than an object moving at relative to the ship is moving at relative to the shore. If there is no force acting on the object, it is moving at steady velocity in both frames: both are inertial frames, defined as frames in which Newton's first law holds. And, since is constant, the acceleration is the same in both frames, so if a force is introduced the second law is the same in the two frames. Any dynamical system can be analyzed as a (possibly infinite) collection of parts, or particles, having mutual interactions, so in principle Newton's laws can provide a description of the motion developing from an initial configuration of positions and velocities. The problem is, though, that the equations may be intractable -- we can't do the mathematics. It is evident that in fact the Cartesian coordinate positions and velocities might not be the best choice of parameters to specify the system's configuration. For example, a simple pendulum is obviously more naturally described by the angle the string makes with the vertical, as opposed to the Cartesian coordinates of the bob. After Newton, a series of French mathematicians reformulated his laws in terms of more useful coordinates -- culminating in Lagrange's equations. The Irish mathematician Hamiltonian then established that these improved dynamical equations could be derived using the calculus of variations to minimize an integral of a function, the Lagrangian, along a path in the system's configuration space. This integral is called the action, so the rule is that the system follows the path of least action from the initial to the final configuration. Derivation of Hamilton's Principle from Newton's Laws in Cartesian Co-ordinates: Calculus of Variations Done Backwards! We've shown how, given an integrand, we can find differential equations for the path in space time between two fixed points that minimizes the corresponding path integral between those points. Its path can be represented as a graph against time -- for example, for a ball thrown directly upwards in a constant gravitational field this would be a parabola. Initial and final positions are given: , , and the elapsed time is . Notice we have not specified the initial velocity -- we don't have that option. The differential equation is only second order, so its solution is completely determined by the two (beginning and end) boundary conditions. We're now ready to embark on the calculus of variations in reverse. and in fact if this equation is true for arbitrary , the original equation of motion holds throughout, because we can always choose a nonzero only in the neighborhood of a particular time , from which the original equation must be true at that . By analogy with Fermat's principle in the preceding section, we can picture this as a slight variation in the path from the Newtonian trajectory, , and take the variation zero at the fixed ends, . In Fermat's case, the integrated time elapsed along the path was minimized -- there was zero change to first order on going to a neighboring path. Developing the analogy, we're looking for some dynamical quantity that has zero change to first order on going to a neighboring path having the same endpoints in space and time. We've fixed the time, what's left to integrate along the path? using the standard notation for kinetic energy. establishing that on making an infinitesimal variation from the physical path (the one that satisfies Newton's laws) there is zero first order change in the integral of kinetic energy minus potential energy. The integral is called the action integral, (also known as Hamilton's Principal Function) and the integrand is called the Lagrangian. This equation is Hamilton's Principle. Fermat's principle was easy to believe once it was clear that light was a wave. Imagining that the wave really propagates along all paths, and for light the phase change along a particular path is simply the time taken to travel that path measured in units of the light wave oscillation time. That means that if neighboring paths have the same length to first order the light waves along them will add coherently, otherwise they will interfere and essentially cancel. So the path of least time is heavily favored, and when we look on a scale much greater than the wavelength of the light, we don't even see the diffraction effects caused by imperfect cancellation, the light rays might as well be streams of particles, mysteriously choosing the path of least time. We started with Newton's equations of motion, expressed in Cartesian coordinates of particle positions. For many systems, these equations are mathematically intractable. Running the calculus of variations argument in reverse, we established Hamilton's principle: the system moves along the path through configuration space for which the action integral, with integrand the Lagrangian is a minimum. We're now free to begin from Hamilton's principle, expressing the Lagrangian in variables that more naturally describe the system, taking advantage of any symmetries (such as using angle variables for rotationally invariant systems). Also, some forces do not need to be included in the description of the system: a simple pendulum is fully specified by its position and velocity, we do not need to know the tension in the string, although that would appear in a Newtonian analysis. The greater efficiency (and elegance) of the Lagrangian method, for most problems, will become evident on working through actual examples. We'll define a set of generalized coordinates by requiring that they give a complete description of the configuration of the system (where everything is in space). The state of the system is specified by this set plus the corresponding velocities . For example, the -coordinate of a particular particle is given by some function of the 's, and the corresponding velocity component . and since are all fixed, the integral over is trivially independent of path variations, and varying the path to minimize gives the same result as minimizing . This turns out to be important later -- it gives us a useful new tool to change the variables in the Lagrangian. This constant of motion is called the energy of the system, and denoted by . We say the energy is conserved, even in the presence of external potentials -- provided those potentials are time-independent. We'll now look at a couple of simple examples of the Lagrangian approach. In 1784, the Rev. George Atwood, tutor at Trinity College, Cambridge, came up with a great demo for finding . It's still with us. The Lagrangian approach is, of course, to write down the Lagrangian, and derive the equation of motion. gives the equation of motion in just one step. It's usually pretty easy to figure out the kinetic energy and potential energy of a system, and thereby write down the Lagrangian. This is definitely less work than the Newtonian approach, which involves constraint forces, such as the tension in the string. This force doesn't even appear in the Lagrangian approach! Other constraint forces, such as the normal force for a bead on a wire, or the normal force for a particle moving on a surface, or the tension in the string of a pendulum -- none of these forces appear in the Lagrangian. Notice, though, that these forces never do any work. On the other hand, if you actually are interested in the tension in the string (will it break?) you use the Newtonian method, or maybe work backwards from the Lagrangian solution. A simple example of Lagrangian mechanics is provided by the central force problem, a mass acted on by a force . a constant, the angular momentum. This can then be used to eliminate in the first equation, giving a differential equation for . and in fact the angular momentum, we'll call it . 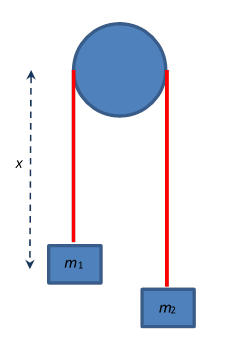 This can be understood by realizing that for a fixed angular momentum, the closer the particle approaches the center the greater its speed in the tangential direction must be, so, to conserve total energy, its speed in the radial direction has to go down, unless it is in a very strongly attractive potential (the usual gravitational or electrostatic potential isn't strong enough) so the radial motion is equivalent to that with the existing potential plus the term, often termed the "centrifugal barrier". Both these results link symmetries of the Lagrangian -- invariance under rotation and time translation respectively -- with conserved quantities. This connection was first spelled out explicitly, and proved generally, by Emmy Noether, published in 1915. The essence of the theorem is that if the Lagrangian (which specifies the system completely) does not change when some continuous parameter is altered, then some function of the stays the same -- it is called a constant of the motion, or an integral of the motion. To look further at this expression for energy, we take a closed system of particles interacting with each other, but "closed" means no interaction with the outside world (except possibly a time-independent potential). Therefore, recalling from the time-independence of the Lagrangian that is constant, we see that this constant is simply , which as we shall see, is the Hamiltonian, to be discussed later. Another conservation law follows if the Lagrangian is unchanged by displacing the whole system through a distance This means, of course, that the system cannot be in some spatially varying external field -- it must be mechanically isolated. the momentum of the system. This vector conservation law is of course three separate directional conservation laws, so even if there is an external field, if it doesn't vary in a particular direction, the component of total momentum in that direction will be conserved. In the Newtonian picture, conservation of momentum in a closed system follows from Newton's third law. In fact, the above Lagrangian analysis is really Newton's third law in disguise. Since we're working in Cartesian coordinates, , the force on the th particle, and if there are no external fields, just means that if you add all the forces on all the particles, the sum is zero. For the Lagrangian of a two particle system to be invariant under translation through space, the potential must have the form , from which automatically . Conservation of momentum followed from the invariance of the Lagrangian on being displaced in arbitrary directions in space, the homogeneity of space, angular momentum conservation is the consequence of the isotropy of space -- there is no preferred direction. 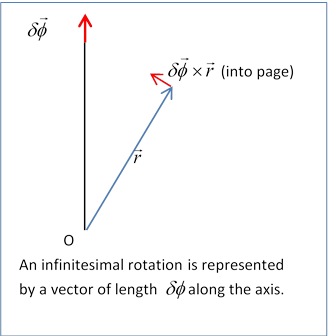 So angular momentum of an isolated body in space is invariant even if the body is not symmetric itself. is a constant of motion, the angular momentum. For a system of particles in a fixed external central field the system is invariant with respect to rotations about that point, so angular momentum about that point is conserved. For a field "cylindrically" invariant for rotations about an axis, angular momentum about that axis is conserved.